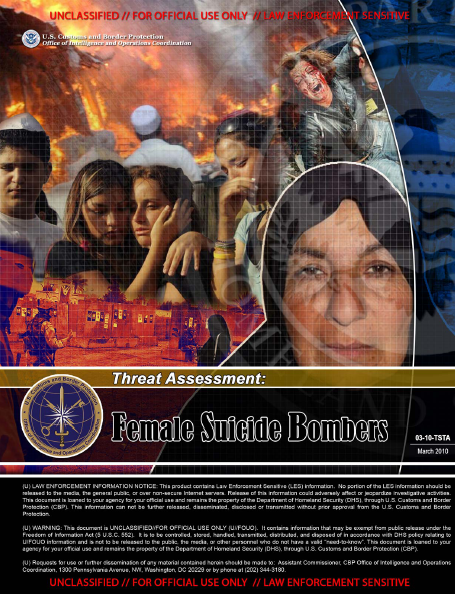 (U/FOUO) In an effort to provide situational awareness reporting to Customs and Border Protection (CBP) field managers, analytical, and targeting units, the Terrorism and Strategic Threat Awareness Branch of the Office of Intelligence and Operations Coordination (OIOC) is focusing this report on the threat from female suicide bombers which could potentially affect CBP operations. (U/FOUO) In the aftermath of the Christmas Day suicide bombing attempt over Detroit, it has become apparent that terrorist organizations continue to scrutinize and attempt to circumvent border security procedures by using a variety of methods. One such method that has not been fully analyzed is the possible use of female operatives. The media has recently reported information suggesting that al-Qa’ida will expand the scope of the female suicide bomber outside of Iraq to include western airliners. (U/FOUO) The main focus of this assessment is to explore possible operational means and methods that could be utilized by female suicide bombers. A female suicide bomber is knowingly and readily willing to blow herself up using explosives attached to her body for a terrorist purpose or cause. She usually requires significant psychological preparation, yet relatively little operational training. • (U/FOUO) While the majority of suicide bombers have been men, there have been in excess of 262 women suicide bombers since 1985. • (U) More stringent security measures and procedures in airports have led terrorists to seek alternative methods to circumvent explosive detection measures, which could possibly include the use of female attackers. • (U/FOUO) Al-Qa’ida, reportedly, is considering using breast implants as a means to conceal explosives, which would be detonated by a liquid filled syringe that would replicate diabetics injecting insulin. Diabetic supplies (insulin and syringes) are not prohibited items on airliners. (U/FOUO) Since the first known female suicide bomber attack in 1985, there has been a rise in the number and intensity of female suicide operations in Middle Eastern countries. The latest attack occurred in early February 2010 when a female suicide bomber detonated her vest in a crowd of women and children in Northern Baghdad. Eighteen women and 12 children were among the 54 Iraqis killed in the blast. Another 117 Iraqis were wounded, some seriously. While female suicide bombers have previously struck in Iraq and Israel, security sources regard the use of women for al-Qa’ida attacks on Western targets outside the Middle East as ‘inevitable’. Additionally, open source reporting states that British Intelligence is warning of new methods of developing explosives that can be surgically implanted inside a woman’s body in an attempt to avoid detection by security personnel. • The majority of female suicide bombers are young, primarily between the ages of 17 and 24, however; the overall range in age for female suicide bombers is from 15 to 64. • Female suicide bombers come from various educational, religious, social and personal backgrounds. • Education plays a role, with the “more educated” females such as lawyers, paramedics, or students accounting for the greatest percentage of suicide attacks. • Most tend to be of average economic status and are rarely impoverished. • Some may be dishonored through sexual indiscretion, or unable to produce children. • Some appear motivated by revenge or grief of losing husbands or children as in the woman who killed 15 people in Diyala province on December 7, 2008. Her two sons joined al-Qa’ida in Iraq and were killed by security forces. • The appearance of being nervous. May seem preoccupied or have a blank stare. • Focused, intent, and vigilant. Such an acute focus may result in lack of response to verbal questions or commands. • An awkward attempt to blend in. Behavior may seem odd or overtly out of place. • Avoidance behaviors toward authority. If security is present, the suicide bomber tries to be inconspicuous. • May be praying fervently to him/her self. • Behavior may be consistent with that of a person without any future such as presenting a one-way ticket, or being unconcerned about receiving change for a purchase. • Profuse sweating that is out of synch with weather conditions. • (U/FOUO) Intelligence regarding the effectiveness of surgically implanted explosives. • (U/FOUO) The effectiveness of body scanning on surgical implants.